is a tough material, like the material that shapes your ear. 02. The Swell Shark, found in New Zealand, barks like a dog. 03. Weird things have been found inside a shark, such as a nail, a bottle of wine, a treasure chest, coats, a suit of armor, a drum and a torpedo. 04. A shark’s skin is covered with denticles, which are small, razor-sharp teeth. Denticles can be removed from a shark’s body. After the small teeth are removed, the remaining skin can be made into very strong leather. A pair of shoes made from shark leather can last up to four times longer than shoes made with cowhide. 05. Sharks have very good senses. Sometimes a shark is called “a swimming nose”, for its great sense of smell. Sharks can easily detect prey that is in the sand, as well as at night. A shark also has a remarkable sensitivity to vibrations in the water. It can feel the movements made by other animals that are hundreds of feet away. They can hear sounds from thousands of feet away. Sharks can tell the direction from where the sound is coming from, too. 06. Sharks cannot eat Puffer Fish, because the Puffer Fish inflates like a balloon and pokes the shark’s mouth with its sharp needles. 07. Most sharks give birth to their babies. Only a few sharks lay eggs. Most sharks have six to twelve babies at a time, but the Hammerhead and Tiger Shark can have as many as 40 babies at a time. 08. Most species of sharks can swim up to 20-40 miles per hour. 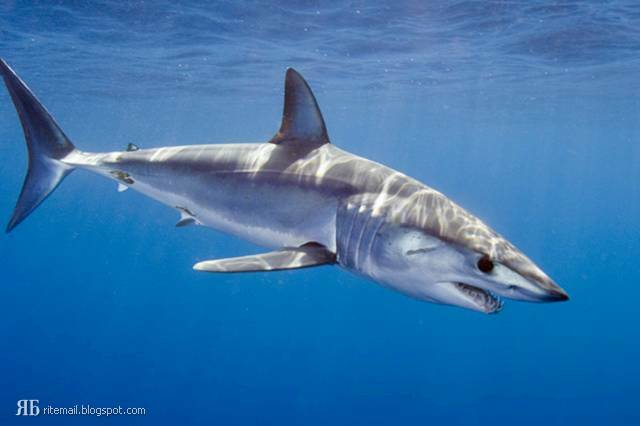 A Mako Shark has been recorded at more than 60 miles per hour. 09. A shark has three types of fins. They have two dorsal fins on their back, one fin beneath their body, called the pectoral fin (not all species have it), and the caudal fin is the tail. 10. The Whale Shark is the biggest fish in the world. 11. A Whale Shark has more than 4,000 teeth, but each is less than 1/8 inch long. A shark may go through 1,000 sets of teeth during its lifetime. When a shark loses a tooth, one replaces it. 12. A Whale Shark weighs about 90,000 pounds. The second largest shark is the Basking Shark. It can be as much as 40 feet long. 13. Question: What is more dangerous to people - a shark or a wasp/bee? Answer: wasp/bee Every year, 100 people die from wasp or bee stings, yet hundreds of millions of people go swimming, and sharks kill only about six people. Only about 25 sharks have been known to actually attack people. Every year, people kill thousands of sharks. They are killed for food, oil, skins and sport.